Unique material science helps prevent the infiltration of air and water, but lets water vapor escape to prevent rot and mold inside walls. DuPont™ Tyvek® HomeWrap® is the original house wrap, incorporating unique material science that helps keep air and water out, while letting water vapor escape. How It Works: The unique nonwoven structure of Tyvek® HomeWrap® makes it breathable, allowing moisture vapor to pass through. This helps promote drying in wall systems, to help prevent mold and water damage. In addition, Tyvek® HomeWrap® stops air movement through the walls, helping insulation perform closer to its full R-value, to provide a more energy-efficient home. Not All House Wraps Are Equal: The superior performance of Tyvek® HomeWrap® is what separates it from other types of house wraps, as shown below. Perforated Wraps: Perforated house wraps require “micro-perforations,” or thousands of holes, to allow the product to breathe. While this can help keep moisture from getting trapped inside walls, it also gives water and air a way in. Perforated wraps give up a great deal of resistance to air and water penetration in order to achieve some level of vapor permeability. Water and air infiltration can lead to the potential for water damage and make insulation less effective, leading to higher energy costs. Low Perm Microporous Film Wraps: A low perm, microporous film wrap is manufactured in a two-part process, where a coarse fabric backing with no protection for a building is laminated with a fragile film, in order to pass minimum requirements for water and air resistance. The film layer is delicate and routinely compromised in the real world through tearing and abrasion. These products can perform well in controlled conditions, but they are a problematic choice for real world workers and job sites. DuPont™ Tyvek® WB is Very Different: The DuPont Building Envelope system consists of products specifically designed for proper moisture and air management within wall systems. Tyvek® WB is a uniquely engineered product made by spinning extremely fine high-density polyethylene (HPDE) fibers that are fused together to form a strong, uniform web. 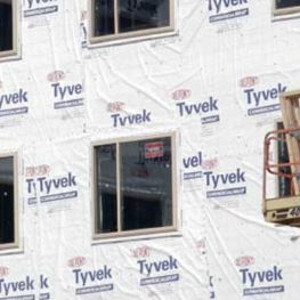 The tough structure of Tyvek® is engineered to create millions of extremely small pores that resist bulk water and air penetration, while allowing moisture vapor to pass through. Ease of Installation: Tyvek® HomeWrap™ is easy to install. It is pliable, so it readily wraps around corners, interfaces at joints, and wraps over unique architectural geometries.